Bias is the diagonal surface direction that occurs at a 45-degree angle to the lengthwise and crosswise grains of woven fabrics. The fabric has the highest degree of stretch of any woven direction when it is cut on bias. Binding is a way of neatening a raw edge using a separate length of fabric, usually in a contrasting colour or material. Binding can be used as a Hong Kong finish. Piping is a way to emphasize a seam or edge and can add strength to corners that might receive a lot of wear. For both binding and piping, strips of fabric cut on the bias are used as this makes them slightly stretchy. To cut bias strips fold the fabric diagonally (45°) so that a straight cut edge is parallel to the selvedge (the side of the fabric). 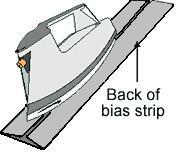 Gently press this fold and use this crease as a guide to mark parallel lines for bias strips. To join bias strips place two lengths, right sides together, right angles to each other and stitch. Open out, press seam open and trim off the overlapping edges. Cut bias strips 4 times the finished width of the binding required. Open up one side of the binding. Place this side of the binding onto the right side of the fabric with raw edges matching and pin. Stitch along the fold line of the binding. Fold the binding over the raw edge to the wrong side of the fabric. Pin and baste the fold of the binding over the line of machine-stitching on the wrong side. From the right side of the trimmed edge, stitch-in-the-ditch where the bias joins the fabric. This stitching will sink into the “ditch” between the two fabrics. It catches the bias that has been folded under on the wrong side and holds it secure. Alternatively, you can slip stitch the turned bias edge to the underside on the wrong side of the shell fabric. Piping can be made by covering cord with strips of bias cut fabric. The cord comes in a range of thicknesses and is readily available from fabric and upholstery stores. Cut and join enough bias strips for the required length and wide enough to cover the cord plus the seam allowance. Lay the cord in the centre, on the wrong side of the bias strip. Fold the bias strip over the cord matching the raw edges. Stitch the open edges of the bias strip together along the length. Use a zipper foot or cording foot on the sewing machine to ensure that the stitches are close to the cord. To attach the piping cord to a straight edge, pin it to the right side of the main fabric matching the raw edges. To turn a corner, clip the seam allowance on the piping cord up to the line of stitches. Ease the piping cord around the corner and proceed pinning it along the next edge. To attach piping cord to an outside curve, place it onto the right side of the main fabric matching the raw edges. Pin it in place, clipping the seam allowance to ensure that the fabric lays flat. 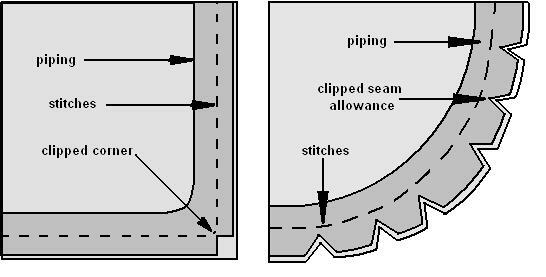 To attach piping cord to an inside curve, work in the same way as an outside curve allowing the seam allowance to overlap where it is clipped. This is one of my favourite seam finishes for unlined bags. This finish is used in couture, but don’t let that intimidate you. It is not hard to do and will make your finished work look professional, knowing that it looks as good on the inside as it does on the outside. With this seam finish, each raw edge is enclosed in a bias strip of lightweight fabric. Use lining fabric, such as rayon or polyester lining, or use lightweight silk if you have it on hand. Be sure to pre-shrink this fabric before using it. You can even use printed georgette to give a pretty finish to your seams. Either match the binding strips to the shell fabric or go for a contrast that will be dramatic. Cut strips of your lining fabric approximately 1 1/2″ wide. Cut these on the true bias. The bias grain helps with turning the edges over ripple free and it will not fray. 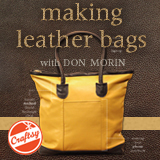 Sew the seam of your bag. Before pressing the seam open, lay the bias strip right side down on the edge of the seam. Sew it to the seam allowance only with a narrow seam allowance. (I like to use the edge of my presser foot as a guide). The resulting finish will be narrow and look almost like flat piping. Press the bias strip away from the seam, i.e. press it over on itself. Then wrap it around the fabric seam allowance to the wrong side of the seam. Stitch-in-the-ditch from the face side. This means stitch right along the edge where the bias joins the fabric. This stitching will sink into the “ditch” between the two fabrics. It catches the bias that has been folded under on the wrong side and holds it secure. Carefully trim away the excess lining fabric on the wrong side. Slide your scissors between the bias and the fabric, holding them sideways against the fabric. Trim as close to the stitching as you can. Because the lining strip was cut on the bias, it will not fray. Press the bound finish nice and flat. 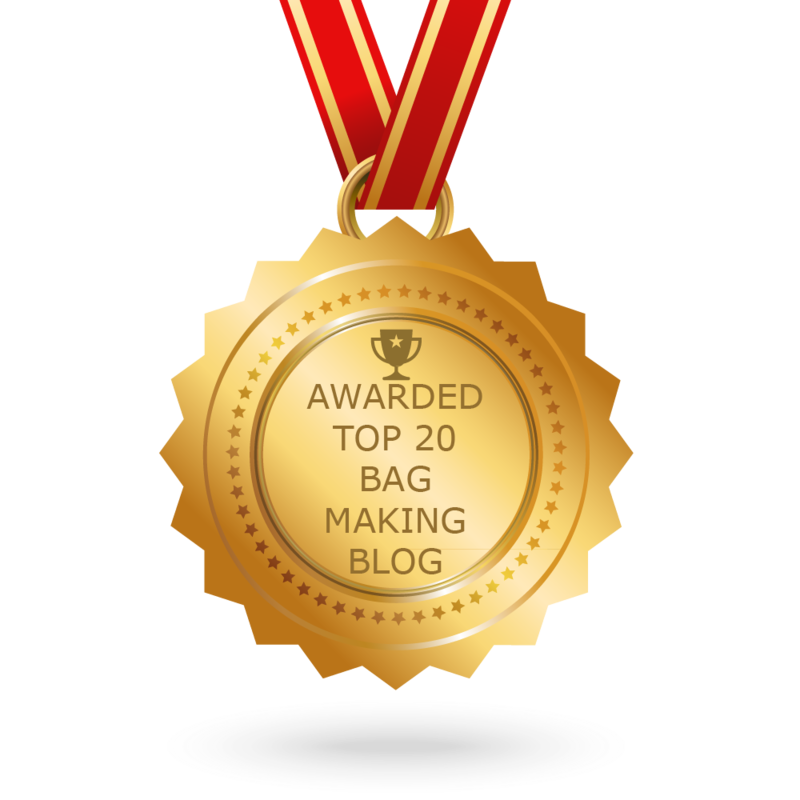 Press your bag seams open. This tool is handy for making your own bias folded tape and is available in 1/4″, 1/2″ , 1″ and 2″ sizes. Note: Some heavier fabrics may not keep their press. At straight grain edge of fabric, fold corner down so cross wise grain meets lengthwise grain to form a triangle. Fold, mark and cut bias edge (45 degree). (the strips widths will differ based upon the finished width of the bias maker you use). Join ends of bias strips with face sides together. Sew a scant 6mm (1/4″) seam, trim ends and press open. Feed bias strip into wide end of bias maker (fabric is face side down). Pin end of bias tape to ironing board. Pull tape maker and press bias tape as it comes through the narrow opening.